Last night my hubby finally came home after being gone working out of town for almost 2 weeks. And today my mother in law is flying home after being here helping me out for several weeks. So a lot going on in my house right now. I'm sorry I didn't post yesterday. But I'm here today with a couple of layouts to share. I made one yesterday for two different challenges at Sketches4all. One of the challenges was for Christy's Around the World Challenges. This one was Paris. I struggled with this challenge because I haven't been to Paris and I wasn't sure which direction to take. I knew I wanted to do the challenge so I finally decided to use an adorable stamp that my good friend, Kelly Massman has. She was kind enough to stamp it out several times for me on card stock and mail it to me to use after I raved about a project that she used it on!! It is of a woman walking a dog with a basket in her hand. The dog looks like a schnauzer to me and I have 3 schnauzers. And the woman just looks elegant (and French! ha). I had picked up a piece of paper that had the Eiffel Tower on it thinking I could use it in some way and ended up using it as the base of my layout. I added eyelets around the stamped image. Inked and colored it and used pop dots under it to give it dimension on my layout. I decided to combine this challenge with Lucinda's (most likely expired) "F" Challenge (also at S4A). The challenge is to use an "F" theme. Mine was Fly to France. Next you had to use fasteners. I used staples and eyelets. And finally you had to use something from Fiskars. I used a Fiskars edge punch and my Fiskars scissors for the fussy cutting. Christy's is definitely still going on until the 28th so I'm good to go. Last weekend I worked my way through a bit of that pile. And finished up this layout with some photos you might have seen recently of my baby girl. What do you think? Keep an eye out here because I have some exciting news and a giveaway coming SOON. Terrific Tuesday to you all!! My hubby emailed me that our realtor wanted to show the house at 1pm TODAY and well do you remember how I mentioned that I had to keep my kids in all weekend because of allergies..... MY HOUSE WAS A PIT! I spent my rest and relaxation time running around like a crazy woman cleaning and cleaning and cleaning! LMAO! But guess what else?? I now have a sparkly clean house (for a little while anyway! ha) I guess I was just meant to clean my house today instead of laze around!! I obviously did not get to scrap anything (yet) today but lucky for you I was a scrapping fiend this last weekend. Here is a super de dooper cute (even if I do say so myself) two page layout of my kids and hubby at Christmas. This was from a Scrapbookfunaddicts kit by Terri Zaelit (I think it is by Terri, my other Christmas kit is designed by Terri) which was sooooooo adorable that I couldn't pass it up at CKC in Seattle. I actually did most of the two pages at the evening crop while I was there but it was just lingering in my to do pile. But not anymore now you get to see how it turned out. You can tell if you look closely at the pictures that it is a total challenge to get any good pictures (and these are the best of the 30 or so I took). But isn't that reindeer FAB!! I love the ornaments hanging from his antlers even though those hooks were a booger to get on there right. And I love that sweet little tree on the 2nd page of the layout. I bought two more kits from them while I was at CKC. One is another Christmas one and one is a dog layout. So you have those to look forward to seeing in the future. Hi there!! It is Monday and I was a scrapping fool this weekend!!! I'm going to start you off with this layout I made using some luscious BoBunny paper and stickers that I got in them mail from my "boss", Fia, over at Sketches4all. I used a sketch challenge that Jessica has going over there right now as my creative inspiration. It was a bit like putting a puzzle together. The picture is of my hubby and I on our wedding day. I did a ton of fussy cutting and cut out the title work with my Cricut using the Cutting Up cartridge. And I went totally crazy with my crystal Stickles but it just seemed like this lovely dovey layout needed the sparkle. I added some ribbon from my stash. I was faithful to my self-challenge and made this card with the scraps. Don't tell my hubby about it because he is getting it for our anniversary! lol Hopefully he doesn't read this post!! I used a yummy sketchabilities sketch. It seemed totally fitting to post about Prima's Product Picks for February on this post because I used their Prima Color Pallette as my inspiration for my layout and card!! There is still time for you to try to win this collection of goodies too. So hurry on over and get in on the fun! It is kind of crazy because my kids and I have been sick for weeks and finally we went to see the doctor on Saturday and guess what?? We have allergies. We are taking some allergy medicine and we all feel soooooooooooo much better!!!! Such a simple fix. It was recommended that I keep the kids in this weekend because the air quality is bad right now and it is very windy....which has been crazy since it is a holiday weekend and longer than normal.... They have been going stir crazy. We were supposed to have rainy weather here but it rained one night while we were sleeping and now it is just cool and sunny. Which makes it even harder to keep the kids in the house. I was supposed to have my electrician out today to fix a few things in the house but he called to say that the guards on the front gate wouldn't let them in because it is a holiday and "there will be no work done in the neighborhood today"! How annoying is that?? What if my washer was broken? Seems ridiculous to not let him in when he is doing quiet work inside... Oh well...he is coming tomorrow instead. How is your holiday weekend going?? I'm missing my follower friends comments!! Has anything inspired you creatively lately?? Want to share?? And not only did I made a card but I made a frame too!! I made the frame for Mitsue's Altered Frame Challenge at Sketches4all. You have until the 28th to enter. Go check it out! I also made a card from the left overs from another DT layout and mentioned it the other day but never bothered to take a picture and show you so here that one is too! Can you believe it is Friday!??!! We have a 3 day weekend for the kids here because Monday is President's Day. My mother in law decided to put on the disguise too....LOL Isn't she hilarious!!? There is an awesome blog candy giveaway over at Creating a Crafty Life. 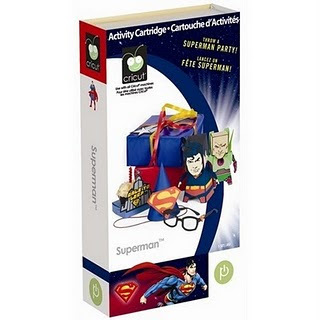 It is the awesome Cricut cartridge Superman!!! YUMMY!! Think of all the fabulous things you could make with it!! She is trying to reach 100 followers so go check out her blog!! You will be happy you did. With all the cold weather that most of the country has been getting lately, I am ready to think of doing fun outdoor things in the sunshine! Well the first thing I looked at was the swing sets for kids. I have 5 kids ranging in age from 3-10 years and I have always wanted to get a really cool swing set for them. And there are a ton of different sets to choose from there. I was really looking at those gorgeous ones that are loaded with fun things like little houses, climbing walls and monkey bars. Here is a picture of my dd outside riding her toy. I also couldn't help myself and looked at the fab playhouses they have there too. (I mean if you are going to dream...dream big right??!!) There are some amazing ones that I would have loved to have had when I was a kid!! They actually have them in a large variety of prices so they are totally something that we could save to get for the kiddos! And quite a few have free shipping too! Another thing I was looking at was a Portable Tetherball System. I absolutely want to get one of these for my kids. My 3 oldest kids are obsessed with tetherball and play it at school everyday. They would just love to have one set up here at our house. CSN has over 200 stores online and you can find pretty much anything you might want at one of them. I bet you have seen some CSN giveaways on blogs you follow. I know my friend, Marlene at Disguised as a Grown Up, occasionally has giveaways from them on her blog. So go check them out and feel a little of the sunshine!! I struggled with it because I was trying to only use scrap paper that was on my desk. I tore it apart twice before finally settling on these papers. It isn't my favorite but it's okay I guess...... What do you think?? Input please!! I started out the day not really in a scrappy mood. After all the kids went to school I decided to just do nothing... I watched a show on TV that I had recorded and read some scrapping magazines. Well, by the time the show was over I was motivated to go scrap something!! I used paper from Prima's Eire Collection and the chipboard flowers are from Sassafras. The fern is from K & Co. I made a card with the scraps but I haven't taken a picture of it yet.... The Stickles are still drying. You know how I like my Stickles! ha I will show it tomorrow. I also made a layout for the S4A DT sketch which was shown on the site so now I can add it here. I used a picture of the kids sitting on Santa's lap. My oldest boys are 10...I'm wondering how much longer they will let me take them for this picture?? I've been doing it since they were 1 year old. I'm blank right now on my supply list for this layout. LOL I made it a few days ago and my brain is not working tonight. ha So just enjoy the picture! I added a funny picture of my sweet brother and my dog, Hattie. She thinks she is hot stuff too!! I've been sick (still) but have still be scrapping so I have a couple of things to show you. One of the things I made was for a DT. I think I will be able to post it tomorrow. 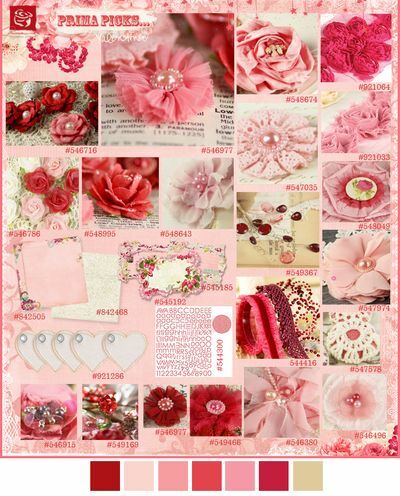 The first thing I want to post is a layout I made for my Stash Challenge at Sketches4all. I actually scraplifted it from a blog and can't for the life of me remember which one. I was so excited when I saw the original that I immediately went to my scrap desk and started making it! My challenge at S4A is to use black on your layout and to also use a white pen (ink, chalk or paint will be okay too). I am excited to see what everyone comes up with. I also made a "Pick Me" Valentines Card for my daughter to give to her teacher. She was happy with it. You kind of get a sneak peak at the DT layout I made because I used the scraps to make this next card. I have been pretty good about doing this so far this year. I used the awesome sketch challenge #55 from Sketch and Stash Challenge Blog. My husband is out of town so I won't be doing anything fancy to celebrate Valentine's Day. I do plan to make a special dinner for the kids tonight. Do you have any Valentines plans?? What to share them?? I am! I might just skip to St. Patricks Day or move on to Easter!! Or maybe I could just start on spring. Chip Chop Shop Turns 1!! The Chip Chop Shop at Etsy is turning 1. There is a giveaway to celebrate so hurry and go check it out. Ends February 14th!! But I did want to post a few things for anyone out there wanting to see something new on my blog! I made this banner (my first, so be gentle - ha) for the Sketches4all blog hop (which has ended). I had some lace scraps and decided to just cover each of the hearts that I cut out with my Cricut. I added some glittery flowers with bling and some stickles. Then just punched holes and threaded the ribbon and voila....a banner! I have it hanging by my desk and it is bright and cheery. My two 5th graders celebrated Valentine's Day at school on Friday. I made them each a card for their teacher. That has a picture of them in the center of a flower and the card says, "Pick me", on the outside and "to be your Valentine", on the inside. I like how they turned out and their teachers loved them! I also made a couple more of those "sweeties" jars. I might post them tomorrow for you to see. I Completed All The Challenges! I have a couple of cards and an altered item to show you today. I made them for the Sketches4all Valentine's Decor & Blog Hop. First I want to show you one of the jars I got at a thrift store. I was looking on a Sketches4All DT's blog during the blog hop and noticed this cute idea to make for my kid's teachers. This jar was kind of short and made decorating it a bit hard. The other two jars I worked on are taller and slimmer. They were easier to work on. I made this for my kid's teacher but it conveniently worked for Michelle's Altered Item Challenge at S4A. The next card is one I made for Melissa P's Sketch challenge. I fussy cut the flowers out of some paper from Fancy Pants -Love Birds. The striped paper on the front is actually cut from the cover sheet of the paper pack. During the blog hop I saw a layout on one of the DT's blogs that had a button heart around the picture....I scraplifted the idea for my card. I think it might have been a bit more difficult to try to get it on a card. And the card is now a bit heavy. My next card is for Erin' Red & White Challenge. You could only use red and white on your card. It was fun to try to figure that out! I ended up fussy cutting the sentiment and heart out of some DCWV paper I had. The ribbon was from Recollections. The last one is my cupcake card that I made for Christy's Scraplift/Give some love challenge. I liked the idea of a using a cupcake for a card and saw a fun card made by DT Jessica that had a cute cupcake on it. I actually ended up doing all the challenges for this special event at Sketches4all. I had a blast working on them all. And was so happy with all the new faces that showed up and participated!! I had a great turnout on my LOVE SONG Challenge. I have more creations to show you tomorrow. The winner chosen by Random Generator is number 16....Marlene said, " This is a gorgeous layout". Go to Sketches4all and see who won my LOVE SONG challenge!! Sketches4all Valentines Decor and Blog Hop is Here!! This Post Will Stay At The Top Until February 11th. Please Scroll Down For New Posts. 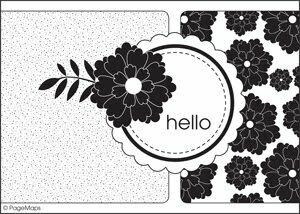 Welcome to the Sketches4all Valentines Decor and Blog Hop! I am the first stop on the way so if you started here you are on the right track!! You need to find the hearts on each DT's blog. Add them up and then go here and post the number you have found. Be sure to leave a little love on each blog along the way. After you finish up here your next stop is Michelle H.
This Blog Hop starts today Saturday, February 5th and ends on Tuesday, February 8th. Please note that the ending date of this event has now been extended until Thursday February 10th. I will now be posting winners on the 11th of February. This gives you a little more time to work on the challenges and try to win some prizes!! There are going to be fun challenges posted by two of the DTs each day with RAK's for the winners!! So you should really go visit S4A every day!!!! There is already a Pre-Challenge posted that you can join in on too. The Valentines Decor & Blog Hop challenge I posted today at Sketches4you is to use your favorite love song as inspiration for making a paper craft. You can use a love song title as the title of your layout (like I did) or be inspired by lyrics of a love song. Go on over to Sketches4all and join in on my challenge! I would love to see your creations. I used the love song, At Last by Etta James. One of my all time favorite love songs! It worked perfectly with the feeling of my layout. The picture is of my daughter who we adopted from China after waiting an extremely long time. Now go hop along and remember there are many different ways you can win. 1. Enter the special event challenges posted by the DT and be in the drawing for a RAK on each one. 2. Some of the DT along the Blog Hop will offer a RAK on their blogs. 3. Complete 4 special event challenges and you will be in a drawing for a paper pad of Nikki Sivils New Collection - Sugar Cookie!!! YUMMY!! 4. Complete ALL the challenges and be in the drawing for the grand prize of a $10 gift certificate to an awesome online scrapbook store!! Remember to leave a comment on each blog along the way and you can follow me if you want. I would love it if you did but it is not a requirement of mine. I would like you to share your favorite Valentine's Present or Valentine's Date Story. The funnier or crazier the better!! There will be a drawing for a winner from the comments to win a RAK. Check back here on the Thursday, February 10th to see who won!! You will find all the information and challenges at Sketches4all in the Forum under Special Events. Now on to Michelle's blog for the next stop on the blog hop!! Sorry I haven't posted the cards I promised yet but I have picked up a little cold and really didn't feel like blogging yesterday. I did want to come on here and let you know that the Sketches4all Decor & Blog Hop (SD&BH) has been extended until tomorrow the 10th of February. So, if you haven't had a chance to join in...you still have a little time left. There are a bunch of fun challenges and prizes for the winners. I am going to start by showing you my calendar page for February. I used a picture from my dd's birthday party on Sunday. I got this calendar kit from Basic Grey at CKC in Seattle. I am having the best time doing the pages each month. I really like how this month's page turned out...how about you?? Like it? I also made this Tri-Fold card for Michelle's SD & BH Tri-Fold Card challenge. This is the first tri-fold card I have made. I tried to combine it with 2 other challenges (well I actually did combine it with 3 other challenges) but the boss lady over at S4A said NO COMBINING. I combined it with The Boss Lady, Fia's, color challenge and with Jessica's Hearts & Love Challenge (use at least 14 hearts and the word Love on your project). It was pretty disappointing but what can you do? The other card I made I made for the Pre-Challenge which was to use a heart, a stamp, a punch, a flower, bling and a Valentine's Day Theme. I really really like how this card turned out. I used DCWV Scrapbook Kit In A Stack (Love & Wedding) paper. I used a Fiskars Heart punch and a Martha Stewart edge punch. My "flower" was the rose paper I used. I stamped Love and used heart shaped brads and fussy cut the big red heart. My bling is the the black rectangle that I added around the Love Stamp. I used a white gel pen to "stitch" around the heart and to put some dots on my hearts. And I used Crystal Stickles because I always use Crystal Stickles! ha And I inked the edges of some of my paper with some black ink to help make them POP. I also added a Vellum definition of the word LOVE just for fun. Do you use Vellum very often? What is your favorite way to adhere it to your project?? Here is a picture of them that I took before they left for school. Enjoy. Yesterday was my dd's 9th birthday yesterday (Sunday) and we had a "Super Bowl" party for her. My 3 year old daughter unfortunately was left sitting at the table with the cake in front of her and decided to eat as much of the icing off of it as she could possible get before anyone noticed her! She did this after we had all eaten a piece but still....LOL OMG! It was a pretty fun day and Olivia had a ball. I plan to do a layout or two with the pictures but I thought I would share a few with you first. I made a couple of cards on Saturday for the Valentine's Decor and Blog Hop which ends tomorrow. So if you haven't already hopped along get to hopping!! And there are 9 fun challenges and great prizes to be won. GO check it out. I will post the pictures of the cards tomorrow. Hope your weekend was as fun as ours. Happy Monday!! Has anyone been missing me? ha I didn't really have anything good to show or share so I took a little break. But I am getting very excited because Sketches4all is having it's first blog hop of the year!!! The Valentine Decor and Blog Hop!~! The actual blog hop goes from Saturday, February 5th and ends on Tuesday, February 8th. So come back tomorrow and start hopping along. It is going to be a blast!! There are 5 ways to win!! 1. 8 DT will be giving away a RAK for their challenges. 2. Some of the DT will be giving away a RAK on their blogs as you hop along on the blog hop. 3. If you complete 4 of the special event challenges you will be in a drawing for Nikki Sivils New Collection Paper Pad- Sugar Cookie!!!! YUM!!!! 4. If you complete all the special event challenges your name will go in a drawing for the grand prize - a $10 gift certificate to an awesome online scrapbook store!! 5. Find all the hearts on each of the blogs along the way. Add them up and post the total of hearts found and your name will be added in a drawing for a prize! There will be a ton of fun challenges!!! Head on over to Sketches4all NOW for the Pre-Challenge that Fia has posted for all you guys who are eager to get started!!!! Be sure to check out Sketches4all every day during the event for all the new challenges posted each day!! I also wanted to tell everyone that Marlene at Disguised As A Grownup is giving away a free (!!!) digi. So go over to her blog and check it out. You want to go there anyway because she is super talented and hilarious!! So I wanted to share how well I did last month on Project 2011 Scrap Our Stash. I did not buy any scrap stuff at all!! If you don't already know about it Project 2011 SoS is a challenge that Denise at Lala's World has started to help encourage us to use our stash. I think she is planning to do it for 6 months (not sure) but I am doing it month by month. And really I am just using it as a way to be more conscious of using my stash instead of buying new all the time. Go check out her blog and see what you think. You can sign up for this challenge too!! I thought I would start you out with a cute photo my baby girl, G. I took this picture yesterday while we were outside and she was playing. I feel kind of bad because the weather has been really pretty nice here in Las Vegas and it seems like the rest of the US is getting pounded by snow. My brother is here helping me out while I recover from my surgeries and he loves the snow. And it is blizzard conditions right now where he lives. So he is really missing it. Are you getting pounded by snow where you live??? Or is the weather nice? I actually scrapped for the first time since my surgery. I made a card for my February 1st Card challenge at Sketches4you. All you have to do is use this gorgeous sketch from Pagemaps and the colors Pink and Gray. Go over and join in!! I also wanted to give you a heads up....starting February 4th until February 8th - Sketches4you is having Valentine Decor and Blog Hop. There will be tons of fun challenges and RAKS. Come and be inspired, have fun and maybe win something! !